For today's Cameo Card, I'm venturing into the ever popular 1991 Topps set. Unlike the previous two, three, oh eight Topps releases, the 1991 set features some spectacular photography. While most of those awesome photos are staged, think Benito Santiago, Roger Clemens, Wade Boggs, etc., this card features some action! Yet, something is totally amiss in this card. Granted, it's a cool cameo of Ozzie Smith, but check out Duncan's silhouette. His jersey is black-lined. On top of that, why are both Smith and Duncan wearing red jerseys? 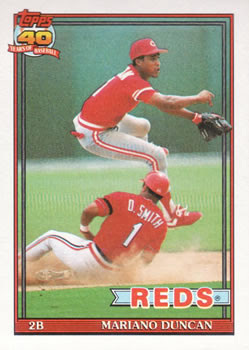 So all you Ozzie Smith collectors out there, you might want to go land yourself a 1991 Topps Mariano Duncan to round out your player collection! What do you think? Spring training game or subtle air-brush?